The Luc Relax Recliner, by IMG Comfort. The Luc features a unique and seriously comfortable pillow-top arm, fully padded. The padding tapers gently from top to bottom, following the arm design. The back cushion's vertical center seam forms a natural "V" shaped cradle letting you sit deep into the chair, which allows the Luc to provide deep support for your entire back top to bottom. Combined with a full chaise style leg rest and telescoping/tilting headrest, the Luc is a supremely comfortable contemporary recliner. Available in manual, motorized, or as a lift chair. Scroll down to see more details and cover offerings. The LUC RELAXER by IMG. Click here to view the schematic and technical information sheet. Comes standard with a manual reclining mechanism. There are optional motorized versions. Please click other tabs to view available leathers, fabrics, and key features. Note that all motorized versions do not swivel 360 degrees, as doing so would twist and damage electrical cabels. Motorized versions swivel approximately 180 degrees. Motorized versions do not feature a glider lock. Lift mechanism and wall saver mechanism versions do not swivel nor rock. The images below are the control options for the motorized version of this recliner. The first one in the series is the WM061. This is our most popular control option, because it comes with the convenience of a USB charging port. With this option, you can plug in a USB charging cable and charge your iPhone, or any digital device that's USB compatible. The second choice is the WM062. This is a beautiful brushed nickel finish. The third choice is the WM065. This is a unique touch sensor, each button being slightly larger than the size of a dime. PRIME is a top grain, pigmented, upholstery leather with a thickness between 0,9-1,1 mm. It has been slightly corrected and Grain embossed to create a uniform appearance in both color and texture. The careful processing and protective top layer enhances the performance and longevity of this leather quality. Therefore Prime is all about value and carefree maintenance. SAUVAGE is a natural milled top grain, upholstery leather made from the best rawhide selection. These leathers are exceptionally soft with visible natural marks. A slight two-tone effect creating depth and life in the article is achieved by using pigments in the initial coat, with later coats containing a contrasting dye. A shiny patina effect gives the leather added characteristics. The thickness of approx. 1 mm makes it ideal for leather upholstery. This natural leather breathes well and responds easily to body temperatures. Sauvage leather gives a desired two-toned effect creating a unique deep rich look and a supple hand while the look and feel improves with age. Due to the nature of this leather, and the two-tone application, some color variations is likely to occur within one hide and between hides. Gruppo Mastrotto - Changing Colors into Leather from Gruppo Mastrotto on Vimeo. LINEA is a premium top grain aniline-dyed upholstered leather with a rich comfortable feel supported by an extensive colour palette. The advanced upholstery protection of Linea retains the natural characteristics of quality leather. Linea has a subtle fine grain with a thickness of 0.8 - 1.0mm which is ideal for upholstery applications. Its softy waxy feel coupled with a semi-matt appearance adds to its luxurious personality. • The Mastrotto Linea range is available on all IMG designs. • Allow an additional 2 weeks for completion. NORWEGIAN QUALITY - All IMG products meet the highest quality standards. The reclining mechanism with integrated footrest is made by the largest specialized mechanism supplier in the world. The construction is based on a hard wood and steel frame with IMG's unique moulded foam. This space age material encases the interior steel frame and sinuous springs. The combination allows for body-friendly curvatures to be covered with perfectly fitting leather or fabric covers. It all adds up to absolute comfort and durability. ADJUSTABLE HEAD AND NECK SUPPORT - Exclusive adjustment system that allows your head and neck to rest in an infinite number of comfort positions. It can easily be adjusted with the grip of a hand. This unique design is a very important feature as it allows you to have comfortable just right customized support for your head, neck, and back as you recline in various different positions. With this feature, you can fully recline your chair, and pull forward the headrest cushion such that you can comfortably watch TV or read without having to strain your neck to hold your head up. MANY UNIQUE COMFORT FUNCTIONS - The IMG Relaxers offer five different built-in functions. All our relaxers swivel, feature effortless reclining motion to easily adjust your back rest angle, have a fold-able chaise lounge style leg/foot rest, feature a relaxing gliding+rocking mechanism, as well as an adjustable head and neck supportive headrest cushion. 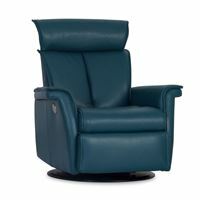 The IMG Relaxer Recliner comes standard with a swivel and rocking mechanism, enhanced with a manual reclining mechanism. This mechanism features a 360 degre swivel, as well as a locking lever that can prevent the recliner from rocking if your preference is such. The manual reclining version is a three position mechanism. Position one is closed, position two is half open with leg rest extended and back rest vertical. Position three is fully open with back rest fully reclined and leg rest extended. The mechanism can be moved by simply shifting your weight forward or back. There are optional motorized versions. Please note that all motorized versions do not swivel a full 360 degrees. They come close, but do not swivel all the way around. This is because doing so would twist cables around the central base and cause damage to the recliner, electrical components, and wiring. The standard motorized mechanism features an electronically controlled piston drive system. The back rest and leg rest recline in harmony to help you find the perfect relaxing position. This mechanism also features a USB plugin for charging your iPhone or laptop. A key feature to the motorized version, aside from the ease of opening or closing the recliner, is that you can start and stop the recliner anywhere between fully closed and fully open and it will hold which every position you stop it in. It's our opinion that this is a great feature in that you can slightly shift your weight or resting position and not worry about the recliner shifting more open or closed. 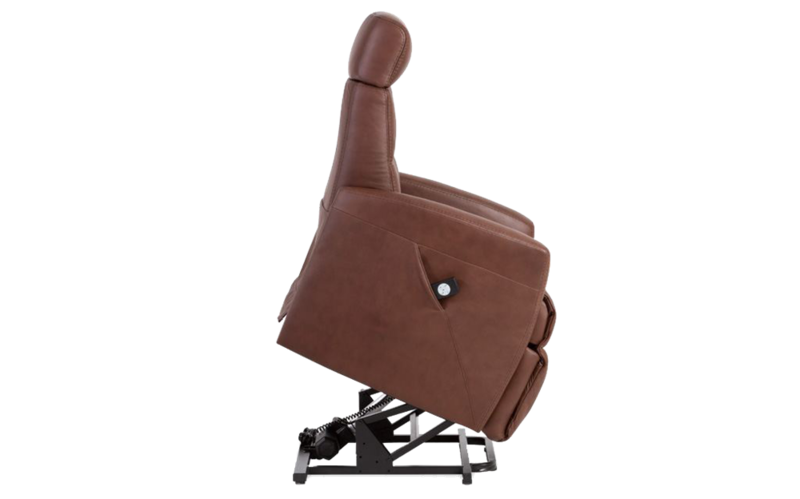 The next alternative is a Lift Mechanism, which has the same reclining functions of the motorized version, plus a lift feature to help you in and out of the chair. The control for this option is a handheld remote. There is a discretely tailored pocket sewn to the side of the chair for storing the remote when not in use. This option does not swivel nor rock. The third and final motorized option is a Multifunction Mechanism. This mechanism has all the features the Lift Mechanism above, but allows you to independently control and recline the back rest and the leg rest separately. This is a key consideration if you have knee or back considerations, and need to have slight separate back and leg adjustments to get perfectly comfortable. The control for this option is a handheld remote. There is a discretely tailored pocket sewn to the side of the chair for storing the remote when not in use. This option does not swivel nor rock. WOOD - Most of our products and components are based on laminated wood construction technology. Utilizing a process called Ultra-Sonic wood lamination, we build strong frames in creative graceful designs. Environmental and consumer friendly glue and chemicals are used in the production process. We use light colored beech wood with an attractive grain to make veneer and laminated parts. They are hard woods and highly suitable for staining in various colors. COLD-CURE SHAPED FOAM - This space-age material encases the interior steel frame and sinuous springs, allowing for body-friendly curvatures to be covered with glove-fitted upholstery. This guarantees absolute comfort and durability. WARRANTY. Ten years on steel frame and wood frame breakage as well as moulded foam collapsing. Five years on mechanisms and moving parts breakage. Two years on leather and fabric covers. Two years on motors, craftsmanship, other materials and parts. The Luc Standard Size Relax Recliner, by IMG Comfort. 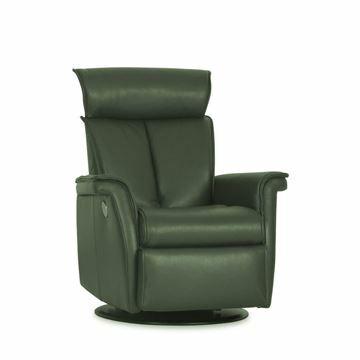 In stock in leather Trend Graphite, and featuring the motorized mechanism with chaise style leg rest. The Luc features a unique and seriously comfortable pillow-top arm, fully padded. The padding tapers gently from top to bottom, following the arm design. The back cushion's vertical center seam forms a natural "V" shaped cradle letting you sit deep into the chair, which allows the Luc to provide deep support for your entire back top to bottom. Combined with a full chaise style leg rest and telescoping/tilting headrest, the Luc is a supremely comfortable contemporary recliner. The Luc Large Size Relax Recliner, by IMG Comfort. In stock featuring the motorized mechanism, and in leather Trend Graphite. The Luc features a unique and seriously comfortable pillow-top arm, fully padded. The padding tapers gently from top to bottom, following the arm design. The back cushion's vertical center seam forms a natural "V" shaped cradle letting you sit deep into the chair, which allows the Luc to provide deep support for your entire back top to bottom. Combined with a full chaise style leg rest and telescoping/tilting headrest, the Luc is a supremely comfortable contemporary recliner. 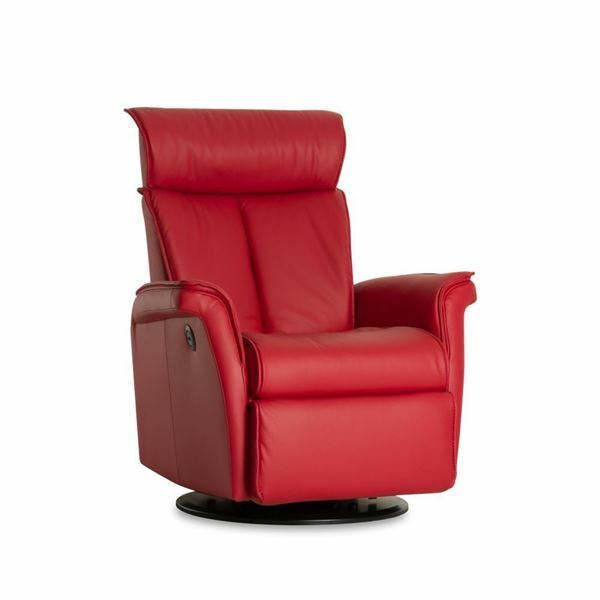 The Boss Relax Recliner, by IMG Comfort. Available in compact, standard, and large size. The Boss features a unique and tremendously comfortable pillow-top arm, fully padded. The padding tapers slightly from top to bottom, following the arm design. Combined with a full chaise style leg rest and telescoping/tilting headrest, the Boss is a supremely comfortable contemporary recliner. Available in manual, motorized, or as a lift chair. Scroll down to see more details and cover offerings. The Divani Relax Recliner, by IMG Comfort. The Divani features a sleek tapering arm design, giving the recliner a very contemporary look. Lateral tufted back rest is ergonomically formed to provide wonderful complete back support. Combined with a full chaise style leg rest and telescoping/tilting headrest, the Divani is a supremely comfortable contemporary recliner. Available in manual, motorized, or as a lift chair. Scroll down to see more details and cover offerings. The Prince Relax Recliner, by IMG Comfort. The Prince features a clean tapering arm design, giving the recliner a very contemporary look. The back rest is ergonomically formed to provide wonderful complete back support. Combined with a full chaise style leg rest and a tilting headrest, the Prince is a supremely comfortable contemporary recliner. Available in manual, motorized, or as a lift chair. Scroll down to see specific details. The Chelsea Relax Recliner, by IMG Comfort. The Chelsea features a unique padded plateau arm, enhanced by a tapering effect as the arm extends lower towards the seat. It gives the recliner a luxuriously comfortable and contemporary look. The lateral tufted back rest is ergonomically formed to provide wonderful complete back support. Combined with a full chaise style leg rest and tilting headrest, the Chelsea is a supremely comfortable contemporary recliner. Available in manual, motorized, or as a lift chair. Please see the below overview and other tabs for comprehensive details on the Chelsea Relaxer. The Peak Recliner by IMG Comfort. The Peak features a truly unique wood element, enhanced by open sides. The combination gives the overall chair a modern and sophisticated appeal. The wood accents are topped with a plush arm pad, offering great comfort when resting. And the wood is available in many different finish tones. Please see below for more details, sizes, and options. The Verona Relax Recliner, by IMG Comfort. The Verona features a unique plush padded arm, enhanced by a tapering plush back rest cushion. It gives the recliner an extremely cushy and luxuriously comfortable sit. The lateral tufted back rest is ergonomically formed to provide wonderful complete back support. Combined with a full chaise style leg rest and tilting headrest, the Verona is a supremely comfortable contemporary recliner. Available in manual, motorized, or as a lift chair. The Verona is also available with a motorized headrest and lumbar backrest. Scroll down to see more details and cover offerings.